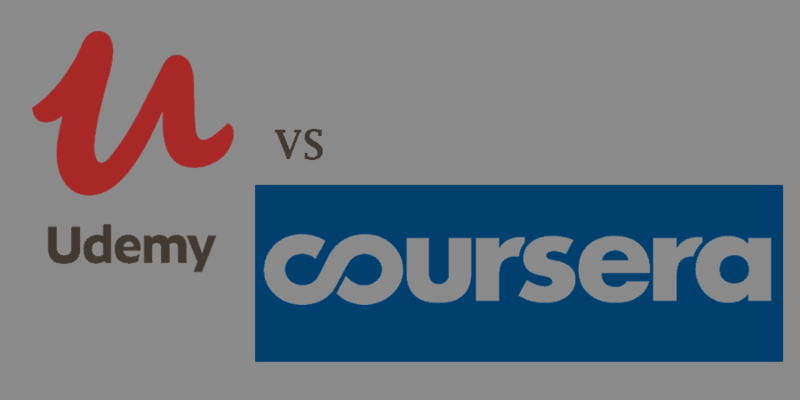 Udemy and Coursera are two well-known great online learning platforms. Although they have their differences which we’ll discuss soon. Personally if you ask me, I’d say despite its limitations, online learning is the greatest revolution in present-day education. It’s cheaper & convenient. Online learning often works well with your family and work obligations. Now coming to Udemy and Coursera, l as mentioned earlier they are both great places to find online courses. But to help you decide which to choose let’s go through their pros and cons. Coursera offers over 1700 courses which are available in a variety of languages. Coursera also offers specializations and online degrees which are a compilation of courses aimed at teaching a particular skill, e.g. Web Development, Data Science, Marketing etc. Udemy offers up to 42,000 courses that can be accessed in over 80 languages. The downside here is that although Udemy offers a wide range of courses, anyone can be a teacher. There can be issues from this fact. Some of the teachers may lack formal teaching experience. Hence on Udemy the quality of content offered varies quite a bit between different courses. Also the system becomes very messy due to the large number of courses being offered. Making it hard to follow especially if you intend to learn more than a handful of things at once. The content of Coursera is known for its focus on popularity. As it provides a wide range of topics such as business, mathematics, science, etc. Most of the Coursera’s courses material is from the actual university course. When it comes to Udemy, the content is very broad, including topics related to art, fitness, music, technology, entrepreneurship, business, language, etc. Coursera offers course content in the form of programming assignments, video conferences, and tests, so that the students can keep on practicing for the development of skills. However, these assignments are not free as you’ll have to pay to access them. The course content can be followed by beginners too as it’s very easy to understand. Udemy courses are mainly offered in the form of videos lectures, but some of them also have exams and assignments related to programming problems. The course level of difficulty varies according to the instructor’s course curriculum. Most are quite useful for beginners or any other levels such as intermediate or advanced. Coursera provides you with a verified certificate once you complete a payment for a course or specialization. Udemy also provides Completion certificates for all courses. You must complete the course entirely if you want certificate from udemy. The instructors of Coursera are linked from more than 145 universities worldwide, and its course content is developed only by expert teachers. Now coming to Udemy, well anyone can sign up as an instructor on Udemy to teach about particular fields or skills, and will just have to follow the Udemy’s video guides to create the course content. First of all both sites are budget friendly so don’t worry about the cost. You can access many courses on Coursera without payment, but to obtain certification for the course you’ll have to pay (with price ranges varying between $49-$99). Udemy offers free and paid courses (with price ranges varying between $10-$200) that contain lectures in video format. But don’t worry as Udemy also offers specials such as coupons and discounts. Actually Udemy offers massive discounts ever so often. Always be on the lookout. If you intend to learn specific skills for personal interest or work then Udemy should be your pick. As the courses of Coursera are typically academic in tone which is perfect for you only, if you intend on taking courses that are similar to an academic course. For professionals and executives, Coursera should be your first pick. There are some amazing courses and specializations on Coursera. As a professional or expert, check out the courses that are relevant in your field. There is a search button which will enable you to easily find any courses for your field/career. Both are great platforms that provide interested students with excellent opportunities for online learning. Keep learning. Learn More to earn More!